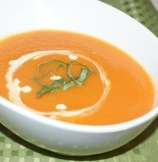 Blanching tomatoes make this soup more intense in flavor and tasty. If you have never blanched tomatoes before, follow this post to learn how to quickly blanch tomatoes at home. 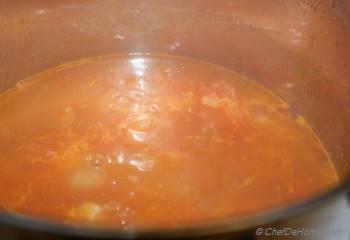 Or you can also use store bought, canned tomatoes for this soup. 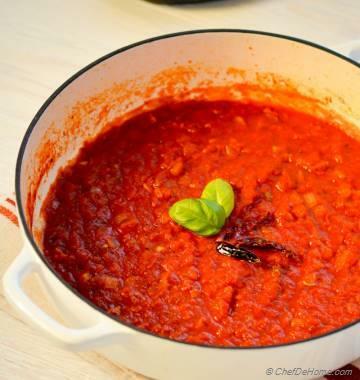 If using canned tomatoes, reduce the tomato cooking time to half. 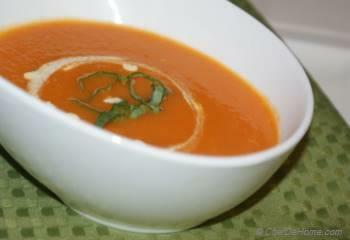 To finish, top the tomato soup with some fresh basil or garlic croutons and always serve this soup hot! 1. Heat oil in a heavy bottom sauce pan. Add chopped onions and saute till onions are translucent. 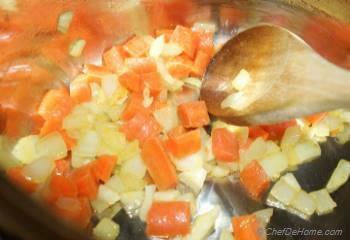 Now, add carrots and celery, garlic, and continue cooking until carrots are soft, about 4-5 minutes. 2. 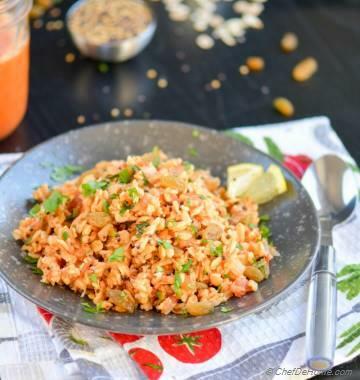 Blanch tomatoes and peal off the skins, Add the tomato pulp along with juice and seeds to the pan. If you want, you can squeeze off seeds of tomatoes, but I like to use everything! 3. Add two cups water and bring the mixture to a rolling boil, let it simmer for 20-25 minutes or until tomatoes are cooked and liquid has reduced by 1/3. 4. Use an immersion blender or in a food processor, puree the cooked tomatoes (making sure to avoid splash as liquid will be very hot). Return the pot to heat, add half of basil, and let it simmer for another 5 minutes. Taste and adjust salt and black pepper. 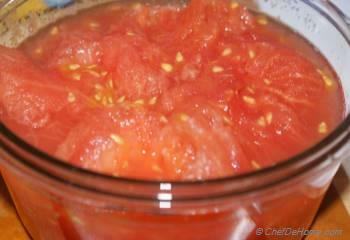 Depending upon acidity of tomatoes, you can also add 2-3 tablespoons of honey at this point to mellow the flavors. 5. 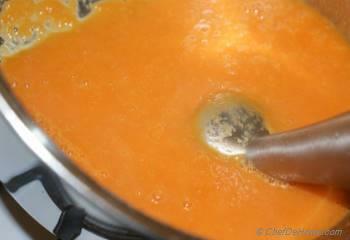 Now stir in 2 tbsp of heavy cream (optional) Ladle in soup bowls and serve hot with bread of your choice. 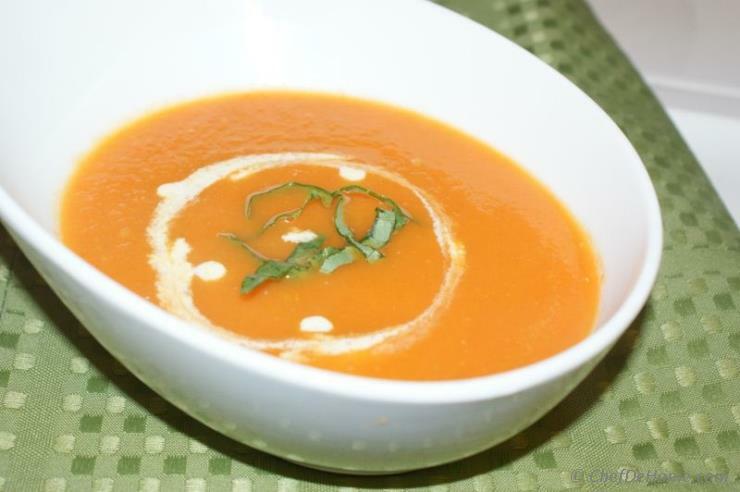 Color of this soup depends all on type of tomatoes used. More ripe and deep red tomatoes will yield more deep red color soup. Orange tint is also due to cooked carrots.